Because 140 characters (@parn_val) is sometimes not enough. How do you have your tea? I don’t have a fixed way to drink tea. Sometimes I want tea to be tea and have it with just a tea bag and hot water. Sometimes I like cooling lemon tea. Sometimes I like green tea… Sometimes I like green tea frappé! I was told recently that to have a proper tea is to have tea with milk. So I’ve been having tea with milk recently. First of all… I’m not a big fan of milk. I don’t have an allergy… but I was forced to drink a VERY LARGE glass of milk every morning by my father (who is very serious about the subject of ‘drinking milk’ every morning). When I was younger I have no say in what I eat. I must eat healthy food and milk, to my dad, is super healthy. I now have a say in what I eat… and I’ve been having a bitter relationship with milk ever since. 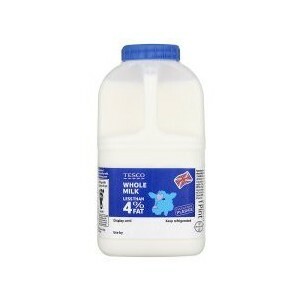 But… yes I now keep the smallest carton of milk they have to offer here in the UK in my fridge nowadays. A little neglected… but it’s there. Milk: Would you like a cup of tea? Viriya: It’s 23:45… I want to sleep tonight, no thank you. Milk: A warm glass of milk before bed then? Viriya: It’s 23:45… I don’t want to wake up in the middle of the night to pee. Milk: … Why did you buy me if you didn’t want me? Viriya: I drink tea every morning! I use a bit of milk in those teas every morning! Milk: But… but that’s not enough… I’m already a few days past my expiry date. Viriya: This is what I don’t like about you. Viriya: I don’t like your expiry date. Milk: But it’s for your benefit. Viriya: Yes. But if I know that you’re definitely going to go bad. Why do I have to pay for you? I’m going to stop buying you. Milk: Because you can drink all of me before it’s over. Viriya: Yea… but I like the ‘go bad’ to come when it comes. Not with a specific date on it. It’s like reading the end of the book before reading the first page. Milk: Viriya, do humans live forever? Viriya: No of course not. We die… but we don’t have our death date labelled on our foreheads. Milk: But you definitely know that one day you will die right? Milk: Do you stop breathing now? Viriya: I have a purpose in life Milk! I have things I want to do. Things I want to see. Things I want to feel. Things I want to eat. I’m not going to die yet! Viriya: I can’t do things I want all the time Milk. There’re invisible strings attached to my body everywhere. Milk: How do you know there’re strings Viriya? Milk: But kites can fly! I’m so jealous of kites! I’m always in the fridge! Viriya: You know why kites can fly? Kites need strong winds to be able to fly high. It’s not easy… If you’re not strong enough… the strong wind will take you down. Milk: Yes. But once you’re up there in the sky… it’s worth it! Viriya: This is it… no matter how far or high kites go… in the end, the string will pull it back. Kites don’t make decisions. It may seem like freedom up there in the sky… but don’t forget the strings. Milk: But Viriya… that means you have a home to return to. Viriya: Exactly… home is definitely one of the strings… along with many other responsibilities. Milk: But if you can’t see them. I can’t see them. How can you be sure they’re there? Viriya: I told you. I can feel them. Milk: Maybe you’re just imagining them. Milk: I bet kites love it when they’re up there against the wind. Even when they know they’re going to have to be pulled back down in the end. I bet they enjoyed it. Viriya: But they are still going to have to go down. Milk: If you’re a kite, would you prefer not to be up in the sky at all? Viriya: No! The whole purpose of a kite is to be flying. Milk: And you can still drink me… I haven’t gone bad yet. Milk: The expiry date is my string Viriya. Milk: I told you… they’re partly imaginary. Note from Val: as always, any comments/suggestions/thoughts below will be forwarded to Viriya. Thank you for reading!